All of the guidebooks raved about how friendly Moroccans are. “Don’t be surprised if you are invited into the home of a complete stranger for dinner.” It’s true, and here’s how it happened, but first, we have to set the scene. Fresh off the plane, with only a little bit of time to kill before the bus will whisk us away from Rabat, we decide to take a walk, maybe see some quick site. It doesn’t take long at all before a very friendly gentleman approaches us with his warm smile and friendly “where are you from?” questions. Out he goes incredibly, it suddenly starts sinking in; there goes my $20. Was it a $20? Yes certainly, but it’s gone, when suddenly, he reappears. He’s paid for the tea, alright, but where is the change? Um, well, he gave it to this shop next door, but the shop is now closed, the owner will be right back, maybe in a half hour or so. Couldn’t we wait a minute? So sorry. I’m getting angry, finally wising up and he’s playing the fool, insisting everything he has done is quite regular and it will only be a minute, wouldn’t we mind waiting? Come on, there’s no other place to get change? It’ll only be a minute. But we have to get going. Couldn’t you wait? I promise he’ll be right back. He should be there now, let me check…no, he’ll return around 2. How about another tea? And suddenly my anger fades away. I was scammed. I know it now. Those were some very expensive teas, but a fairly cheap lesson. I’d not yet been scammed during travel, and this one had me so upset because of how silly it was, but in the great scheme of the unfair universe I was out only $20. What had me worried was the seed of mistrust for Moroccans planted in my gut only minutes after we’d arrived. Only a couple of days later, we’re exploring the Roman ruins of Volubilis, outside of the city of Meknes. 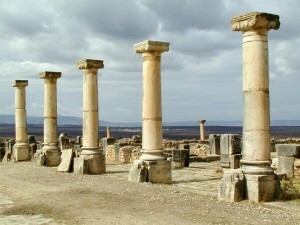 The amazing ruins feature rows of columns and impressive mosaics in a small area less than a square kilometer. Guides swamp the tour busses as they arrived, but we’d taken the local bus on our own, so they were less interested in us and we were able to wander around the ruins by ourselves. A couple of young men with a budding professional camera company asked to take our picture and sell some of theirs to us, but we put them off until later. As the time nears for our hosts/thieves/murderers to arrive, we go through all the gory possibilities. Should we leave our valuables in the hotel room? Not a good idea. How about if the hotel has a safe or something? What if the photographers are in cahoots with the hotel owner and will empty our our rooms while we’re gone? What if they’re going to take us and rob us or sell our organs? We tell the man at hotel reception what we have planned but he doesn’t seem to care and we decide to take what little valuables we have with us, without looking like we’ve packed for travel just to drop by for dinner. And right on time, one of the photographers arrives in compact, beat up, car. He’s weaving through the streets of Meknes, out of the old town, with lights and carts and markets glowing, through suburbs, and past dusty, darker, outlying neighborhoods. “Don’t you live in Meknes?” “No, we live in the next town, it’s not much further.” But outside, it’s getting darker and emptier. We’re going to be robbed and dropped off at the middle of nowhere. You’d think I could actually learn the lesson from the first day. The seed of mistrust is now a small bush scratching at my insides and putting out poisonous fruit. We pull into a run down apartment complex and he parks. We’re escorted into the building and to their place, a two room apartment with a small, low table, between the two rooms which have little furniture outside of low, futon like beds which serve as our chairs. The place is a mess, with clothes lying about and unmade beds. The kitchen, off to the side is no bigger than a closet, and all the more cramped by dishes and utensils piled around. The tea is brought out while one of the friends starts cooking and chat pleasantly with the other. Delicious smells begin to fill the tiny apartment. When the traditional tajine of cous cous arrives, we gather round to eat together. There’s just a large, over-flowing plate in the middle filled with cous cous and vegetables and a few pieces of lamb which they keep rotating towards us and offering. We have to explain that we don’t eat meat, which causes their eyes to widen in disbelief. ‘But meat is a gift from God, how can you refuse his gifts?’ We sample a small piece, in an effort to avoid offense and insist they join us in enjoying God’s gifts. God was pretty stingy by American standards, with only a few chunks of meat, but the generosity of these two poor students was killing my mistrust bush better than any herbicide. A lovely evening concluded, we get back in the car (a few mistrust leaves still hanging on to life I wonder if my little video camera and I are finally going to be dropped off in the middle of nowhere) and brought safely back to the hotel in downtown Meknes where the somnambulant reception takes little notice of our return, or the fact that we never gave him the key to the room. Turns out Moroccans really are some of the most hospitable people I’ve traveled amongst. A similar story was repeated yet again in our short ten day visit. There are scammers all over the world and it’s not only a travelers hazard, but a homegrown one as well, wherever home is. I struggled not to eat the poisonous fruit from mistrust bush in my stomach, but the effort has been rewarded time and again throughout my journeys since. i didn’t know about the legendary Moroccan hospitality until reading this but on my trip to Marrakesh, we met Muhammed (call me Mo) who took us to all of his “uncles” shops. he had a lot of uncles; none of whom looked anything like him. But then we saw many more of the magical courtyards than we would have if we hadn’t met Mo. That’s my best memory of Morocco, the secret worlds hidden behind all of those drab walls. Thanks for conjuring up happy memories. Morocco is still the most foreign feeling place I’ve been. It truly felt like a differnt world to me. I also found it interesting that no-one thought we were American because it seems that so few Americans visit there. They would ask us if we were French, then English, South African and then looked perplexed until we said American…and then they were surprised. Ron – You are crazy. Just don’t do that in Mexico, okay? Oh, come on, you’re that’s the point of the essay! You can’t let petty fears and fox television fear mongering ruin your life! Even when they’re sometimes true! Oh, and I am so glad you commented!